The best made multipin in the audio interconnect business. Quick delivery, typically 2-3 business days. Highly competitive pricing, clever design features and terrific quality. Super service & fast response. The Syntax SVK Series and it's virtually indestructible cousin, the SHD Roadline, both meet MIL-C-5015. Intermateable with all 13 through 150 pin MIL-C-5015 compatible connectors, and low profile 72/101 pin multipins. 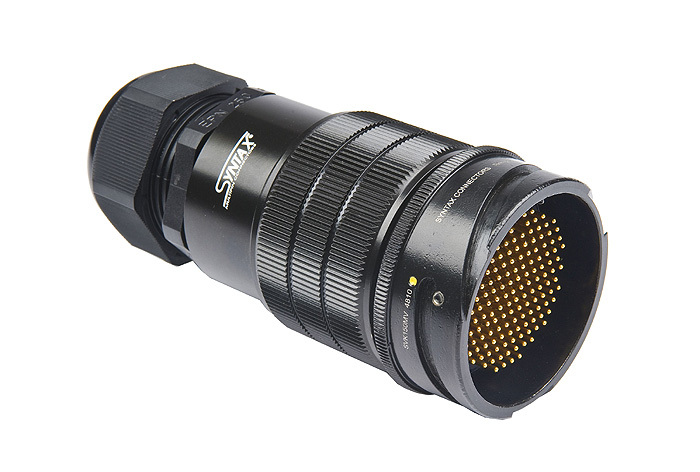 The SVK 19 pin MIL-C-5015 compatible connector is commonly referred to as PA-COM. 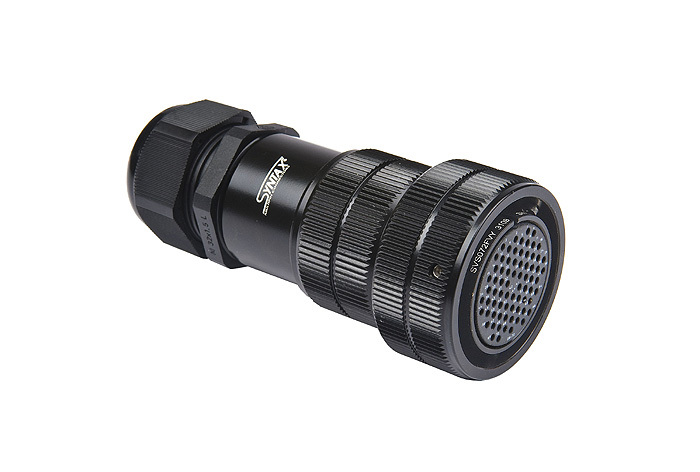 Rugged, reliable IP67 construction + IP67 dust cap featuring a 7-strand stainless steel, Teflon coated lanyard. Precision silver (Ag) or gold (Au) plated machined contacts, available bundled or installed. Crimp+Solder Combo contacts available on 100 & 150-pin versions. Gold or Silver plated contacts as standard products. No NCNR, custom part orders at large MOQ volumes required. Armored contacts available for applications requiring superior mating cycles. IP68 Cable Glands support a wide range of cable diameters. Neoprene locking rings available in durable colors. Flawless cataphoresis painted finish, extremely durable and scratch-resistant. Paint layer uniformity provides smoother mating. SVK & SHD Roadline feature a 100 pin version. Stop putting up with the traditional quality issues of those low cost manufacturing zone, legacy "name" brands! Compare features of Syntax SVK/SHD ROADLINE vs Amphenol China MP-41. Turns out it's not a sprint but a marathon. A backstage multipin must deliver top-notch reliability and superior signal performance over a long and arduous service life. The Syntax SVK and SHD Roadline delivers this value. 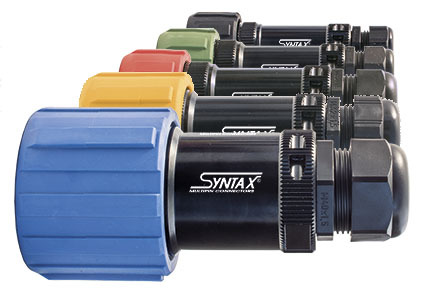 The Syntax plastic cable glands used on the SVK Series are designed for perfect grip and effortless spanner tight seal. Glands are constructed of Nylon 6 and feature a neoprene seal for an IP68 5-bar watertight bond. Blade system delivers optimal strain relief and cable protection combined with a vast clamping range, 6 to 32mm aka .236 to 1.26in. Clever shell design accommodates numerous gland sizes. Multiple threads for secure and rapid assembly. Syntax cable glands are designed not to come loose under torsion or vibration. Optional spiral flex strain relief also available. Rugged IP67 water tight dust caps feature a high-resistance, exceedingly durable 7-strand stainless-steel lanyard, covered by black, anti-scratch Teflon tubing. Integrated eyelet on connector shell designed for anchoring the dust cap assembly. Please visit Downloads to access all Syntax specification PDFs. NOTE: The SVK 19-pin PA-COM is MIL-C-5015 compatible, not CA-COM compatible. Please reference important ordering information.